Turf & Dirt - On Horse Racing: Winslow Homer Paints a Gray Trail!! Okay Kids, It's that time of year again. The flurries are still flying and the wind chill values are below freezing here in Kentucky, but the colts are getting serious. The Derby Trail has begun! This weekend brought us the first of the REAL (read "Graded Dirt") Trail races. 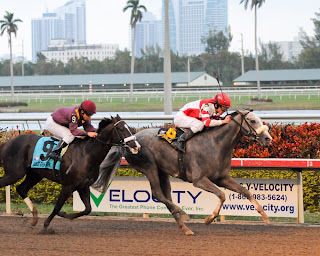 WINSLOW HOMER (Unbridled's Song), whose namesake has painted Eight Bells, came charging to win Gulfstream's Holy Bull Stakes, for Owner Rick Porter, over JACKSON BEND (Hear No Evil). And RON THE GREEK (Full Mandate) was a surprise winner of the Lecomte Stakes at Fairgrounds, over MAXIMUS RULER (Roman Ruler). Last weekend on the plastic, er.. synthetic surface, CONVEYANCE (Indian Charlie) held on gamely in the San Rafael, and RANGER HEARTLEY (Lost Soldier) beat a weak field that included Connemara (Giant's Causeway) in the California Derby. This weekend's WEBN S. at Turfway is the only Derby Trail action. Page 2 of The Word PDF has some Oaks hopefuls, including Eclipse Award winner SHE BE WILD, and multiple winner SASSY IMAGE. Remember, The Derby Word is just a list of my observations. Any betting with real money should involve a more scientific approach, like actual handicapping! 1 SUPER SAVER Maria's Mon Todd Pletcher Calvin Borel Winstar 11/28 CD 1st in Ky. Jockey Club (G2). 3 BUDDY'S SAINT Saint Liam Bruce Levine Jose Lezcano Kingfield Stables 1/3 AQ 1st in Nashua (G2), 11/28 AQ 1st in Remson (G2). 6 CONVEYANCE Indian Charlie Bob Baffert Garrett Gomez Sheikh Rashid bin Mohammed al Maktoum (Zabeel Racing) 1/16 SA 1st in San Rafael (G3), 1/25 HW 1st in Allow.